Hello everyone. I hope you’re all enjoying your weekend. Now that I have everything deodorized including his houndness from Tuesday’s adventure, things are looking up. I missed posting last Saturday because I was out of town and a little busy. I was in Kentucky visiting friends so my day time was well spoken for. This is a trip I take annually. There are two people I know in Kentucky, that I care about. One is a friend I met while working at Ford as an engineer. One day he found himself about to become a daddy and a better job opportunity came up for him so he took it and moved. I actually didn’t get to see him, schedules just didn’t match up and my decision of when to go this year was kind of spur of the moment. He comes to Michigan to visit family a couple times a year so I’ll see him then. The other, I actually met online when I was doing classic camera repairs 10 years ago. The original contact was a business type contact when I was running ads on ebay. Somehow we just clicked and we’ve been talking back and fourth via email ever since. When my mother died, he was my sounding board even though I had never actually met him. Up until that point we had never actually spoken. It was always emails and I figured, like many others, if he ever tired of me, he would just simply stop responding and I would get the hint. That’s never happened though and when my mom died, he decided we should meet so here we are. The 4th year of my annual pilgrimages to Louisville Kentucky. The first year I was given the option of going there or him coming here. I chose to go there and that’s just the way it’s been ever since. Besides, he works 9 to 5 jobs so it’s just easier that way. I’m flexible when it comes to doing things as far as time is concerned. However, actually meeting someone from ‘online’ isn’t something I ever thought I would actually do. We read and hear horror stories about such things but this, turned out to be a good experience. He and his wife are German immigrants who have been here since the mid 1970s. For both, it’s a second marriage. I don’t know the full circumstances of why they split from their original partners, I never figured it was my place to ask, and they don’t offer the information. The neat part of their story is they were actually school yard sweethearts in Germany as kids and somehow they reconnected here in the USA many years later. Both have kids but none together. I’ve never met any of the kids (who are mostly 30-40 y.0. range) but I’ve heard many things about them. We agreed long ago that it was probably best not to discuss politics or religion at any great depth even though, he says, we would likely agree on most things. Still though, those two topics tend to end friendships for me so I stay away from them for the most part. The other reason I choose to go there instead of having him come here is that there are more interesting things to do down there. One can go places and do things that don’t cost a fortune and in many cases are free or very inexpensive. The activities we choose are usually photo opportunities or things that might at least make for some good pictures. I usually let him make the suggestions because he’s been and seen a lot of things. I’m free to suggest as well, I’m just not that good at it. This year, we decided on a couple different daytime activities. 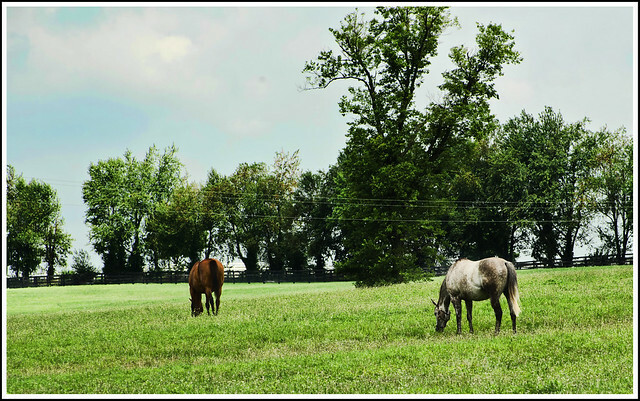 One was to drive out to ‘Bluegrass country’ and look at some of the horse farms. Admittedly, when he suggested it, I thought of ‘The Farm’. 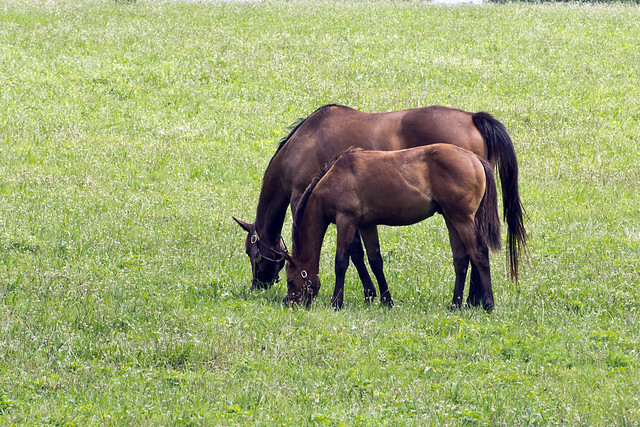 Now, there are horse farms here in Michigan, but I’ve never seen any like these. I couldn’t tell you the names of them but some seemed to go on for miles or at least a mile. The state actually has the roads marked for people to follow around to drive past these places. Not that they are needed, there is no mistaking these farms for anything but horse farms but it’s nice that they acknowledge it anyway. I guess it stands to reason they would, this has been going on in Kentucky since the 1750s. There are breeders there that people from all over the world use and from the looks of some of these places, it’s a pretty lucrative business. There are a couple or more that actually do tours of their places but we didn’t do any of that because it wasn’t happening that day. He described some of these horse barns to me and from the sound of it, they live better than many people do. Truthfully I don’t think the horses care very much as long as they have food, water, and a relatively clean place to take care of business. Our hope in driving around was to spot horses, approach the fence, and through their curiosity, the horses will come to investigate. There were only two problems with that. First, not many horses visible from the road where we could actually stop. Second, the horses we did see, didn’t seem to care if we were there or not. As is typical for one of our little day trips, the lighting sucked for taking photos anyway so I guess it wasn’t a huge loss. We did manage to stop in one location where the horses were close enough to get some pictures. My friend is a compose, expose, and get it right in the camera type of photographer and he does quite nicely at it. I on the other hand am a point, shoot, and hope I got something I can work with shooter. The shots I did manage to get were mediocre at best and required a lot of post processing. You can get some idea of the scale of these places however. I did manage to get some pictures of the actual horses but again, none of them appeared to be very interested in us. There were 6 young ones and just as many adults or more. I don’t know what it is about my taking pictures of animals but most tend to show me their back side rather than give me a face on shot. 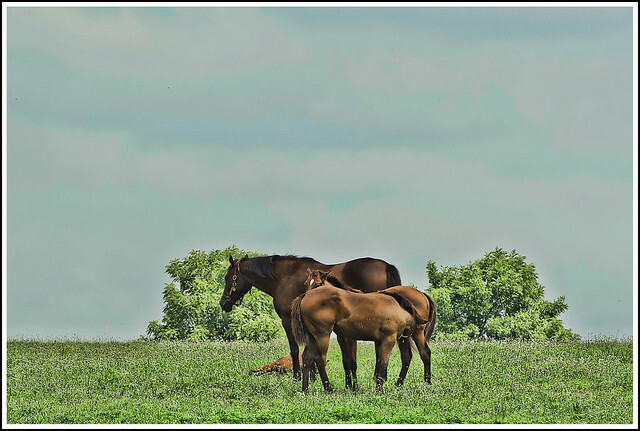 I guess the grass is more interesting to these creatures than the fat guy standing at the fence with a camera. Once in awhile they’ll do something interesting but I’m usually fumbling with the camera too long to catch it. There is always the shot that got away. I have hundreds of photos of The Hound on flickr but each one represents at least 20 tries (he’s camera shy). Anyway, our purpose for going to begin with was to take pictures of horses, and dull lighting be damned, we did. Interesting to note, this particular farm was at a crossroad, one of which was Aiken Road 😀 . Of course, were it not for this blog, I would never have thought anything of it. The other option I was given was to visit a local Train Museum my friend was quite familiar with. 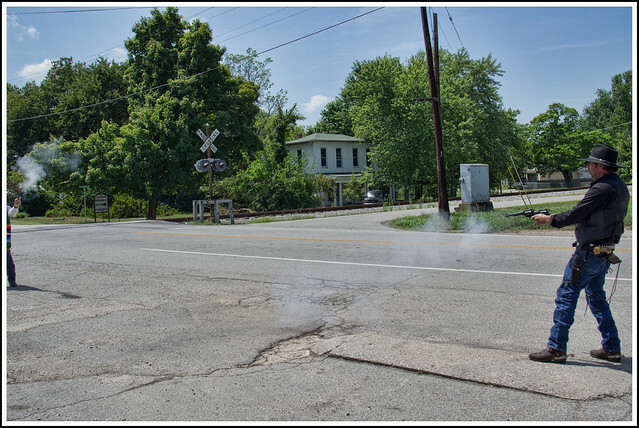 It happened to be in the same area near Lexington so we went back the next day for some photo fun. Wouldn’t you know it, now that we weren’t chasing horses around, the lighting was perfect for taking photos of them. Oh well, typical. Our first stop that day was to get some shots of a local dinner train that had been completely restored. I doubt most of you are interested in pictures of trains so I’ll just show you one of this train. Apparently to ride this train you need to book reservations months in advance. This particular day, we had it all to ourselves (on the outside) and could inspect and shoot at will. Most places like this are behind fences and you have to pay to get anywhere near as close as we did. This wasn’t the museum though. 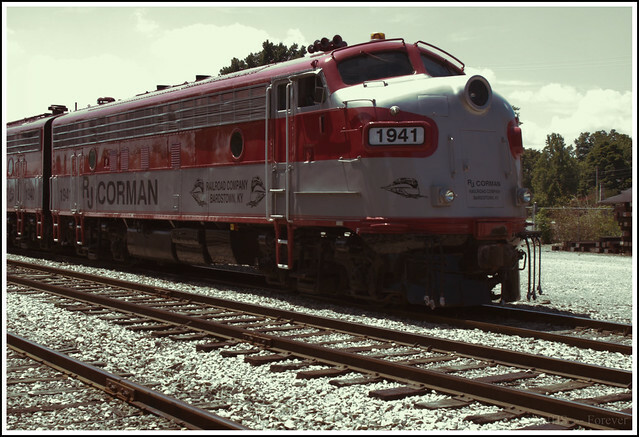 Railroad museums are typically at an old station that has been restored or simply never torn down. They are tourist traps and to see anything, one has to pay money. That stands to reason, without paying customers, they cannot exist. During off peak times they are usually populated by late middle aged men wandering around with cameras and note books studying the details of the equipment. During peak times, lots of families. 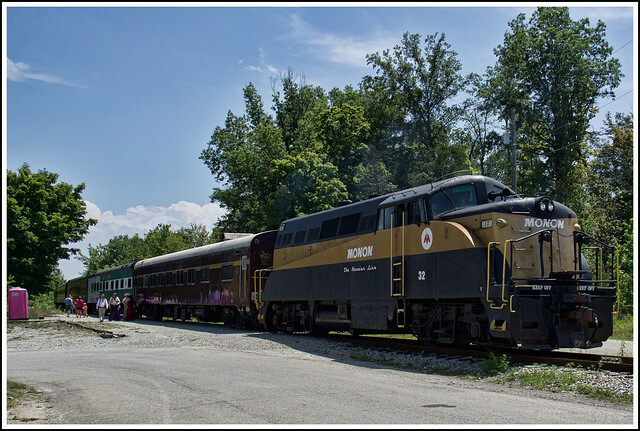 This particular museum has an operating train that people ride daily on trackage owned and maintained by the museum. My friend and I took the ride on this day. Once a month, there is a local group of people who stage train robberies to collect money for charity. 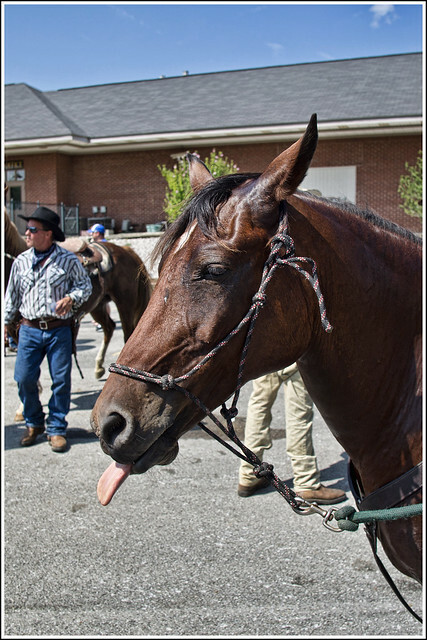 Now, since trains became faster than horses, there haven’t been many train robberies but we’ll play along. The ‘robbers’ are dressed in 1880s western garb. They carry real guns that shoot blanks. They are also on horseback. The train ride is an out and back affair and at the midway point, business is offered to the one local vendor in the area. 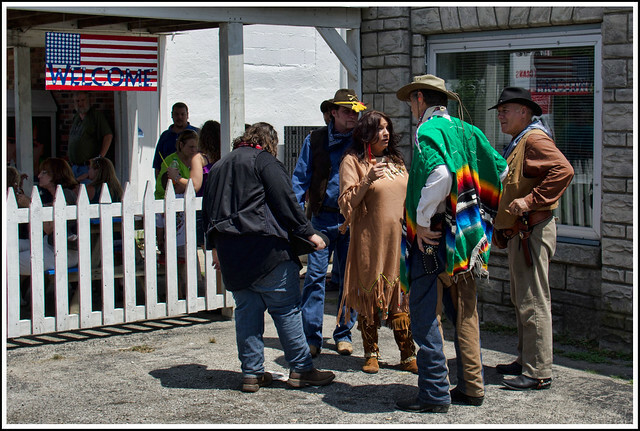 Outside of this place, a gun fight is staged. It isn’t very well planned if you ask me or it was just my fumbling with the camera again. Remember, these are real guns these people are using. Most of them, Colt 45 Peacemakers. Of course, they are firing blanks. Mostly this stop though is a restroom and snack stop. I chose to wait. The ‘rest rooms’ can be seen in the photo below, as can the train we rode. Well, you can see one of them anyway. The ‘ladies’ room. Here are some of the people who put on this show. Is it me or does that flag have too many stars? The train robbery takes place on the return trip about 500 yards from the end of the journey. There’s a gun fight, on horseback, between the good guys and bad guys. Unfortunately, or not, all I was able to see was the smoke from the guns. It is during this fight that one of these people bring a bag though to collect their money for the charity. Most people dropped $5 in the bag so I followed suit as did my friend. I don’t remember the name of the charity but it was some kid’s charity. 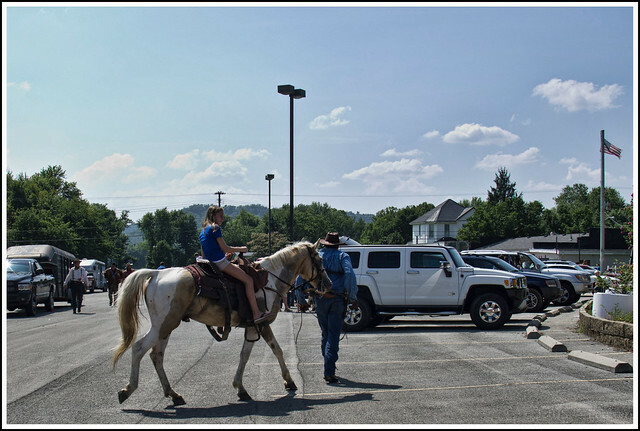 At the end of the trip, the people make their horses available for meet, greet, and a led ride around the parking lot. For some of these kids, I think this was the highlight of the day. Meet Desi (short for Desperado). Desi has been doing these ‘western’ type gigs for a number of years. I asked his owner about the guns and he says that the horse is use to the noise. Desi, he said, is 14 years old (I think I heard that right) and was a ‘throw away’ horse. I’m not sure exactly what that means but apparently he’s had Desi for most of his life. I tried to pet Desi’s face but he didn’t seem to want any part of that so I left him be. It was time to go anyway. That’s about it for my Kentucky day trips. You can see the rest of the photos Here if you like. Later today or tonight, I’ll have a video slide show up with these photos if you prefer to view them that way. I’ll link it when it’s ready. As you might gather, I’m a relax on vacation type of person. I don’t want to do anything too strenuous and I don’t want to think about things when I’m away. I have 360+ days of the year to do that and choose to leave all other cares, where they belong, at home. Hope you enjoyed it. I’ll see you next Saturday (or sooner). I went horseback riding twice. The second time was a wild experience and our guide lost the way we had to lend her our cell phone to be brought back home. It was a lol moment when the horse went under a branch and I had to grab the branch in order to be not knocked off the horse was one of my many experiences that day. I hung onto that branch and the horse kept going. Scared my hubby half to death seeing me swinging from a branch. I laughed big time. Thanks for bringing your road trip and vacation adventures here for all of us to enjoy. Thank you both 🙂 I’ve never been on a horse, always afraid I’m going to hurt him or the other way around. There’s always the possibility in my mind of falling off as well.